I bear no ill will towards our hosts at AT&T park, even though I’m a life-long A’s fan, but I have to admit I was glad to hear the Giants quest for the post-season is officially over. On the one hand, nothing would make me happier than another Bay Bridge Series. However, I’d want it in a year where Cal Bear games wouldn’t be affected by the outcome. So sorry Giants fans, but thankfully you’re eliminated. No more grass infields, lightly painted lines/logos and other AT&T compromises for the Bears! Woohoo! Fewer trick plays: In the first couple games we were treated to a number of deception or trick plays that were successful, the most obvious being the pass-back to Maynard for a big gain against Colorado. Many of these plays were designed to get Maynard running the ball in the open field (linking us back to point #1) and I just didn’t see any attempt to do that against Washington. Changing the tempo: This is the one that was the genesis of this post. Remember when against Fresno State when Cal would occasionally turn a play really quickly, sometimes stringing two or three of those together? That was awesome. Where has that gone? Cal’s tempo was vanilla and slow, letting the defense prepare for each play. The team would do well to find some of that creative rhythm again. Screen passes: This doesn’t as much go back to earlier in the season as it does to the Tedford of old… whatever happened to Cal’s screen passes? I know they’ve been a disaster in the last couple seasons so many of us are glad to see them go, but it seems to me it’s an effective play if coached up correctly and used at the appropriate times. There felt like there were a few moments against UW that they would have been valuable. Now in fairness, I saw some things yesterday I hadn’t seen before. Sofele was showing more determination and ability to bounce off tacklers. He had a pretty good game actually until the Bears sorta gave up on the run (perhaps a little too early?). I saw a defense that had completely solved it’s screen pass problems. So it’s not that the team didn’t do anything interesting or new. But at the same time, it feels like a few new wrinkles the team had added this year, the QB runs, more focus on trickery, particularly to get our superstars the ball in the open field, and changes in tempo that kept the defense off balance, have been lost. I hope the team remembers those things and reincorporates them later in the season. CJ Anderson on the goal line? Why wasn’t CJ Anderson at RB on that final goal line stand? He’s the running back one wants in that situation. It would have made any bluff of running inside a lot more credible even if we didn’t give it to him and heck, did the coaching staff remember the hit he delivered to get into the endzone earlier in the game? Maybe that play should have been called again, yes? This is the first game the Bears will be playing on artificial turf. Candlestick was grass. Colorado was grass (ruining the perfect north-south split of who has turf/grass in the conference). AT&T is grass (and dirt). So despite the fact that we practice on turf, even on our home away from home practice facility, the Bears get their first chance to show off their speed today. Not sure if this matters much, but worth mentioning. One thing that has been clear watching the matchups of the last few years is how much the story was the UW defense. Sark/Holt has had the Bears number and has shut down the Cal offense. Once that resulted in a defensive struggle (last year) and once it resulted in a tuckered out defense that couldn’t keep up with an on-fire Locker. This is probably the key to the game. If the Cal offense is able to score points, expect the Bears to win. The other big question is how good is the Cal defense. Against our weaker opponents, it looked like last year’s defense. At altitude against a Pac-12 foe, it looked pretty exposed in the passing game. Was that just the lack of speed while gasping for air? How much did that have to do with the lack of pressure the D-Line was able to get on the QB? Was it just a bad game? I think it’s hard to tell. It’s possible this game is a shootout. It’s possible this game is a defensive struggle. The more I think about it, the more I like that this is an early season, early afternoon game in Husky stadium. We’ve gotten the shaft the last few years, playing UW after the Big Game and late in the season. It was our own doing, wanting that bye mid-season, but it still was bad news. The reports are that Husky stadium will not be full, that’ll help as well. The Bears will do well to score early and keep the crowd out of it. So where does that leave us? The more I think about it, the more I think the Bears are in position to really stick it to UW. They’re hungry for a big win. All the intangibles are on the Cal side. In fact, I’ve got to temper my optimism when predicting a final score, because I don’t want to look foolish. Another week, another podcast with Jason and Ken talking fundamentals of Presbyterianism. Also Cal football! On the agenda beyond Comparative Religion 101: AT&T Park, previewing Washington, a recap of the Pac-12 week, and an overview of the Pac-16 expansion rumors. Plus, no secret word! Sorry. Instead, leave a comment that likens some aspect of Cal Football to Star Trek, as Ken does during this very podcast. 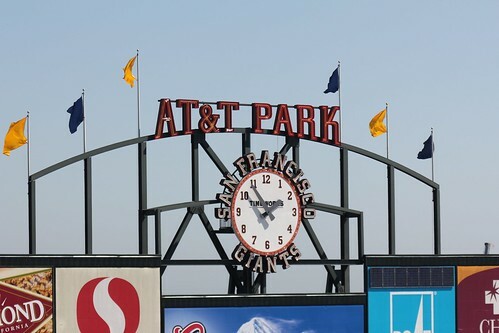 The blue and gold flags flew at AT&T Park today. 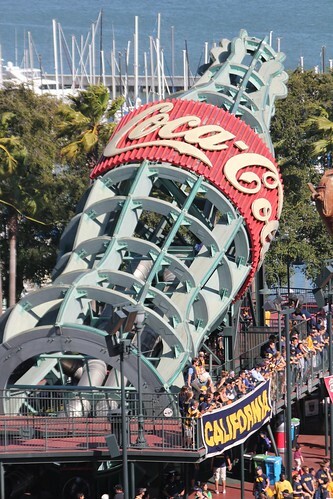 And the California banner was by the Coke bottle. So it turns out the wifi at AT&T park works. But typing on my iPhone is not conductive to live blogging. Anyway, GORGEOUS day here. Could not have picked better weather. Cal is wearing blue over gold. The best look. Early in the second quarter the separation of church and state is four touchdowns. The PA system here is great, in general. But today it’s a disaster. At Memorial I could blame the old system, but here there’s no excuse. I can’t hear the announcer but the guy on the field sounds fine. Whoever is in charge, you are doing it wrong. Fix this. Let’s say I’m about to leave my house on the way to the Cal game at AT&T. I put my backpack full of stuff by the door. My wife decides she’d prefer to use that backpack so she takes all my stuff for the boys (food, sweatshirts, etc.) out of the backpack and puts all the stuff she needs for the day, puts it in the backpack and puts it right where I left it. I pickup the backpack, put it in the car and pack up and leave none the wiser about the change in contents. I go to my friend’s house to pick him up, as he’s coming to the game and we get on the road. About 10 minutes later I get a call on the cell. My wife explains about the backpack switch. So I turn around and the whole way back home I’m belittling my wife. What an idiot she is. Why’d see take the backpack in the first place? Or at least why didn’t she tell me? Or if not even that, why didn’t she put it someplace other than the exact same place I put it so I wouldn’t be confused? What an bad call by her. We get home, everyone piles out of the car and my wife meets us at the door with a different backpack loaded with the stuff I originally had. She apologizes, admits the mistake was hers and sends us on our way with no effect on the final outcome, although the final score on the arrival time at the park was closer than it should have been. Don’t you think my wife has the right to reprimand me for my behavior when she finds out later about my belittling her in the car (my kids are blabber-mouths) even though the original mistake was hers and she has admitted as much? And just as much, that’s why all the scoffing about Tedford being reprimanded by Larry Scott, the Pac-12 commissioner, is short sighted. The Pac-12 has rules and one of those rules is that they don’t air the family laundry to the general public. There’s an internal process to complain about bad calls and those grievances shouldn’t be taken to the press. If there’s an argument to be made in Tedford’s defense it’s that he really didn’t say much at all, just an off-hand remark it was a bad call. Did he really insult the referees or “create doubts about the credibility of the Conference’s officiating program”. News flash: refs make mistakes on occasion. Merely pointing it out doesn’t seem that egregious. He didn’t seem to complain. But that’s not what people are focusing on. They’re focusing on the fact that the league admitted it was a bad call. In my opinion, that’s not relevant. Coaches are part of the Pac-12 family and they’re not to speak badly of it. It appears not even in small ways. …and as a man who loves his family and would never say anything negative about my wife or kids, that doesn’t see so outlandish to me. CRITICAL UNIFORM UPDATE: This is for co-blogger Jason, who’s always interested in uniform stuff: The Bears will be wearing blue-on-blue (see the bottom of the article). It’s my favorite combo. The Bears will be on the sideline that runs along the third base line. The biggest change is the fact that there is room for teams to be on opposite sidelines. … The football configuration was moved eight feet toward the third base line, giving more room to the sideline in right field. It also made it safer for players to run through the end zone that is in left field because the left side of the end zone now leads to the open part of the fence where it meets the third base grandstand. Is it just me or is that a little confusing? If the two sidelines are the 3rd base side and the right field side, both teams were on the right field side in the Emerald Bowl. How can moving the field towards the shorter 3rd base side give it more room? Perhaps they mean just the opposite? Pay for play cost: The Blue Hose will receive $400K to come play the Bears. Considering that they’re coming all the way across the country it doesn’t seem like all that much in today’s era of nearly million dollar pay-for-play payouts. Still a lot of money compared to what was paid 10 years ago. West of Pittsburgh: From the same (2nd) article, the farthest west Presbyterian has ever played is against Pittsburgh. I’d say ‘they’re not in Kansas anymore’, but Kansas would be farther from home than they’ve ever played before too. To put this in perspective, every time Cal plays UW, WSU, ASU or UA, i.e. twice a year, they travel further from home than Presbyterian ever has. WOW! It’s worth noting that Hansen seemed to have more trouble throwing on the run. While they didn’t use it extensively, Colorado did do some rollouts to keep the pressure off of Hansen. However, it generally didn’t work out very well for them, because of his inability to be accurate while throwing on the run. I also stand by my previous statement that Hansen really didn’t have that good of a game. If Luck was playing for Colorado, Cal would have been crushed with all the open guys that Hansen missed, even when he wasn’t on the run. Richardson obviously was key later in the game, but he also had 3 key catches on the 1st drive of the game. In addition he had a long reception on the 2nd drive, just after Maynard’s interception, that got Colorado down to the Cal 25. (As an FYI, that catch and a screen for 15 yards was all it took for Colorado to get the field goal, as the Bears stopped it right there. As for Richardson, there’s no doubt he played a very physical game. He was a powerful combination of a big possession receiver and speed. Maybe it’s just because I’ve got an aging memory, but I didn’t remember that Maynard’s interception was in between Colorado’s first two drives. Cal had been moving the ball well before that poor decision. But instead of stealing the momentum from Colorado by taking it all the way down the field, it allowed Colorado to get right back into their rhythm that they had established on the 1st drive. Of course everyone remembers the booth review later in the game where the Bears got robbed, but there was another one on the first drive where they didn’t overturn the receiver being out of bounds that in my mind the Colorado receiver was clearly out of bounds. The key being he didn’t have reception until very late, not that he didn’t drag a toe. We didn’t get a very favorable game from the replay booth. Jeez the refs were bad/confused in this game. It’s not so much that they made bad calls, OK, there were a couple bad ones, but it just took them a lot of talking to make the right decision. Pass interference at the spot of the foul -> nope only 15 yards, etc. After watching the blocked extra point, I’ll take back my criticism of Tavecchio on that. He got the ball up pretty quick. The key to the block was a defender getting through the A-gap, somewhere you just CAN’T afford to let someone through. So when you’ve got a guy 4 yards in the back field and it goes off the top of hit arms 7 feet in the air, Tavecchio got his ball up enough. Seeing as how one of the two blocks at Fresno State was a combo low-kick, too much penetration problem, that means only one of the 3 misses was fully Tavecchio’s fault. The bigger issue seems to be blocking by the long snapper and the guards (the other blocked kick penetration was up the middle as well). The attempted halfback pass by Sofele that ended up being a “sack”, was a rare bad play call for the game. Tedford seems to have a weak spot for seeing that trick pass plays don’t work inside the redzone. There’s just not enough field for the receivers to get the sort of separation needed for someone who doesn’t have quarterback level accuracy to be able to make what needs to be an easy pass to a wide open receiver. That just doesn’t happen on a short field. The screen passes in my mind are one of the most distressing things about the game. I can tell you right now that our next few opponents are going to be trying screens a lot until we prove conclusively that we can stop them. What was so distressing was just how inept the Bear defense was in sniffing them out. They were out of position. They got suckered into over pursuing to the QB. And finally their pursuit to the ball after the pass was less than stellar. We haven’t seen a lot of screens lately in the Pac-10. Perhaps they’re coming back and we’ll see more of them in the new Pac-12 thanks to our new members seeing an opportunity. Colorado had 3 TD’s but none of them were from inside the redzone. The closest was from 37 yards out. In fact, Colorado only had 3 trips into the redzone resulting in 2 field-goals. If the Bears had managed to prevent the long pass plays, this game may never have been close. I had a fair amount of confidence going into OT because, even though I didn’t have the numbers in my head, I felt the Bears had been doing better in the redzone. My only concern was if it got into a dual of field-goal kickers, which luckily it never did. Miller’s touchdown in the 3rd quarter was SUCH a thing of beauty. The way he carried that defender into the endzone was very impressive. I think it also made a statement about playing physically. Colorado had scored their first touchdown and was starting to dominate more in the trenches. Miller said “Not while I’m out here” to conceding the physical battle to Colorado. Richardson’s first long TD was pretty frustrating because two defenders should have had him. Josh Hill who was covering him took a really bad angle on him and then DJ Campbell looked a little lackadaisical in his coming up to tackle him. Richardson accelerated away, and it was all over from then. By contrast, the 2nd TD was man coverage situation where Richardson just had a speed advantage over Marc Anthony. Another note about those two TD’s… the Bears had a 3-and-out in between the two possessions, which didn’t give the defense much time on the bench to make any adjustments. Not so on the drive that followed where the Bears drove 80 yards, taking 5 minutes off the clock. That gave the defense lots of time to catch their breath and to make the needed adjustments. Really, except for the first couple drives of the game, the only real Colorado drive was the final field-goal drive that tied the game. Everything else were big plays. Having re-watched it, I was less impressed with Colorado’s performance. Don’t get me wrong, a big play offense can be quite impressive, but in this case, it didn’t seem like Colorado really had that much that was special that got them the big play ability. It makes me really worried about the Cal defense. There’s only so much I can blame on altitude. In the 4th quarter the Bears whiffed on a number of potential sacks. It wasn’t that the Bears weren’t getting pressure in the 4th quarter, but that Hansen was a bit elusive and poor angles by the Bears D-Linemen. Talk about divergent overtime possessions. Colorado had strong runs on both their first two plays inside the tackles. Things looked really good for the Buffs. But the Bears stiffened at that point. By way of contrast, the Bears managed to get themselves in 1st and 30. Things couldn’t have looked more bleak. That 32 yard pass from Maynard to Allen, it was nearly a touchdown pass. If Allen could have accelerated away just a little quicker, he would have been in. As it was, he was tackled from behind just a moment before getting into the endzone. Call me a naysayer for the “brotherly connection” being really meaningful. Allen’s a good wide receiver. Maynard’s a fine QB and a gunslinger. But to think that he wouldn’t have thrown the same ball to win the game to Marvin Jones if that’s what had been dialed up… I just don’t buy it. There’s been very little in my mind that has suggested that Maynard is over-emphasizing Allen. Nevertheless, a great way to finish the game. The podcast is back! In this episode Jason and Ken recap the Colorado win, talk about the College Football Overtime Rule with no concrete stats to back us up, preview the Presbyterian game (Cal’s first at AT&T Park), discuss the roots of Presbyterianism, and review the Pac-12 results of the week. Plus, a two-headed secret word! I know this is a first, a Cal home game at AT&T, but I’m looking for advice in regards to parking from people who have driven to AT&T for either Giants games or for the Emerald Bowl and didn’t park in the “official” lots (which are reserved for donors). Originally the plan for my family was to take the ferry in, but as with all things public transit related, their pricing is not very family friendly (I’ve found transit options are usually priced to be competitive with driving for 2 people when considering the hassle factor). The ferry has “event pricing” that is more expensive than their usual fares. It is $15 round-trip per adult and $9.50 per kid, under 5 free. So for my family it’s $49 (2 adults, 2 kids, 2 free). For the Presbyterian game, I’ll have 3 adults, 2 kids, 1 free so it’ll be $64. All of a sudden driving in and dealing with the traffic doesn’t sounds so bad. Frankly, it’s disappointing because I’m a big fan of public transit and getting cars off the road for big events. But in the end, I only have so much money in my budget and public transit is not THAT high on my list of preferred charities. So, who’s parked around the park? Any gems of lots? Anybody used parkwhiz.com and their reservation feature (is it TRULY a reservation)? Anybody familiar with the Townsend garage? Is $27.50 a good deal? What sort of pricing should I expect? I hope everyone’s ticker is still working after that nailbiter. I know I was pacing the room like a caged… um… bison perhaps?